How To Apply For TSPSC Recruitment 2017? 2.If eligible, click on the application form / Download directly from the link given on this page. Step one: Go to TSPSC website: tspsc.gov.in and fill OTR form to generate TSPSC id. Step two: Go to the TSPSC website again and click on the link with notification name and number. Step three: Login with your TSPSC id and date of birth and fill the application form. Step five: On submission of application fee payment, completed application form will be generated in pdf form. The selection of candidates for the post of Assistant Environment Engineer will be done on the basis of performance in Written exam (Computer based or OMR based) followed by an interview of shortlisted candidates. The selection of candidates for rest of the posts will be purely on the basis of marks scored in the written exam conducted by the commission. TSPSC 2147 Posts Recruitment 2017 ,Telangana State Govt.Job Notifications 2017,TSPSC Recruitment 2017 Notification For 2147 DLs,JLs,Principals,AEE(CIVIL & ELECTRICAL),Vetarnory Assistant Surgeons(VAS),Deputy Survayors.Telangana state Govt. 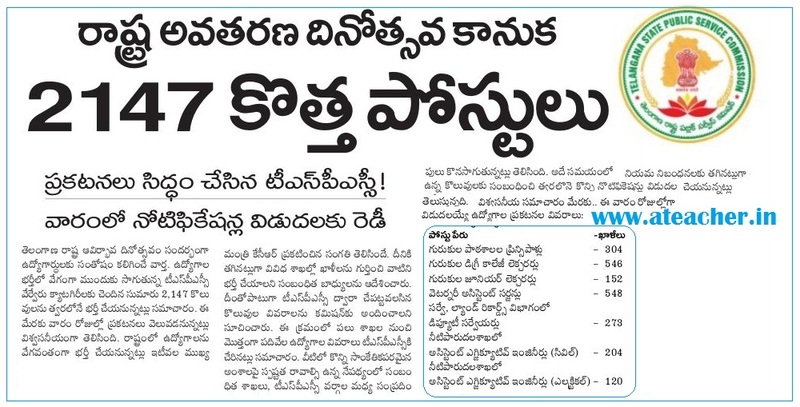 Going to announced 10 Job Notifications On behalf of Telangana Formation Day i.e. 01-06-2017 through Telangana state public service commision(TS PSC).